Stockton Town has now been competing in Senior Open Age Football for 6 seasons. The first year we competed in the 2nd Division of the Teesside League and the following 5 years have been in the Wearside league. Our current leading appearance maker is Adam Nicholson. Adam in this time has won 3 Wearside League Titles, a Wearside League Cup, Monkwearmouth Cup and a Shipowners Cup. 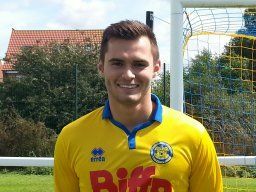 Stockton Town’s All Time Leading Appearance maker, Adam Nicholson. Adam has now played for Stockton Town in all 6 seasons we have competed in Senior Football and in fact joined the Club as a 8 year old, Adam epitomises what we are trying to achieve at Stockton Town, a Stockton lad who has been involved for many years and who holds the same ambitions as the Club itself. The table below show’s Stockton Town’s top ten all time appearances as of 31st December 2014.